I love wearing a kimono, I have a fringed one that I picked up in Delhi last year and I wear it so much in the evenings over here. I find that most restaurants turn their AC up to full so am often chilly inside…this Kimono is perfect for keeping the cold air at bay. I’ve also just made one with a silk scarf from Mysore following A Pair and A Spare’s simple tutorial. I’m yet to add some fringing and beads but it looks pretty good considering how simple it was to do! I tend to wear my kimono like this, with a pair of skinnies and a little cami but I’ve been experimenting with a few other ways to wear them after being inspired by Tara who also has a wee obsession with them. I’m off to Goa tomorrow, for the weekend and am very tempted to try the first look (minus the heels of course!) but I reckon the last look is probably more me. 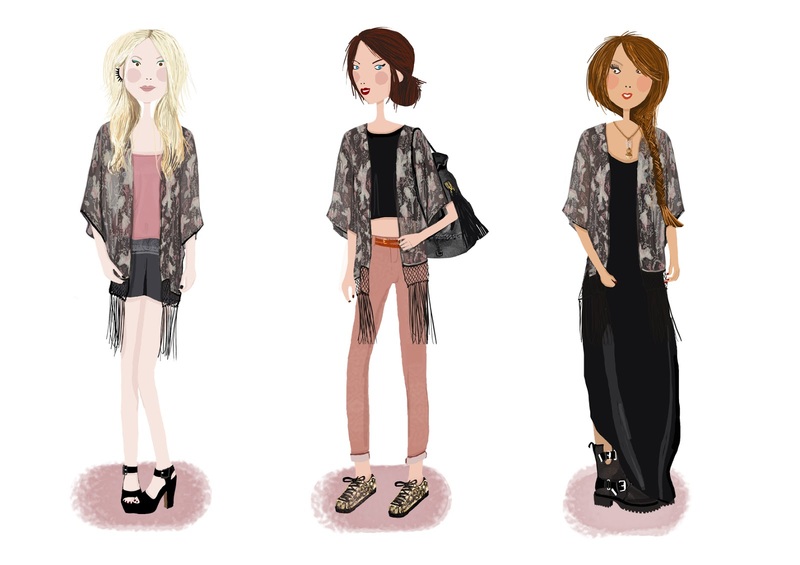 What do you think to kimono’s, how do you wear them? ?